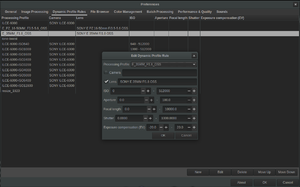 The Dynamic Profile Rules panel in RawTherapee-5.4. Sometimes a single, "static" default processing profile is not enough to cover all use cases. For example, the amount of noise reduction to apply varies according to the camera and ISO setting used. Another example is the kind and amount of lens corrections needed, which is obviously dependent on the lens used. In order to handle such cases, RawTherapee provides a feature that allows to create a default processing profile "dynamically", based on the metadata of the image being processed (such as camera and lens name, shutter speed, ISO value, and so on). This is done by defining a set of "dynamic profile rules". Each rule has a (partial) processing profile attached to it, plus some conditions on the image metadata that define whether the rule is applicable. When a picture is edited for the first time, the list of rules is scanned, and all the profiles that match are combined (in the order given, so later rules can override earlier ones) to build the initial processing profile. In order to activate the functionality, the default processing profile must be set to "(Dynamic)". Rules are defined in the Dynamic Profile Rules section of the Preferences window. the camera name (including brand) as shown in the image info overlay of the Image Editor. If active, by default this entry will cause the rule to apply only to pictures taken with the exact camera specified here (the name is case-insensitive). However, if the entry starts with the re: prefix, then the rest of the string will be interpreted as a regular expression to use for the matching. For example, a rule with the Camera value set to re:SONY ILCE-.00 will be applied to all Sony Alpha a5xxx and a6xxx cameras. The full lens name. As above, a regular expression can be used by starting with the re: prefix. The range of ISO values. The range of apertures of the lens, measured in f-stops. The range of focal lengths used, in mm. The range of shutter speeds, in seconds. For example, enter 0.03 for a speed of 1/30". The range of exposure compensation values, in stops. This page was last edited on 3 April 2018, at 15:25.